Place: Conference Hall of the Hotel "Cosmopolit" Kyiv, st. Vadym Hetman, 6 (m. Shulyavskaya) . At the conference, you can to know new ideas for business, find new partners-realtors, producers, distributors, suppliers and get new experience from the international companies. 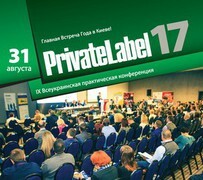 Gallery of novelties PrivateLabel from leading suppliers and retail networks of Ukraine and abroad.